We just returned to Edmonton from Leduc, where we stopped in to visit for Mother's Day. In honour of the day, I present one of my favourite pictures of Mom. 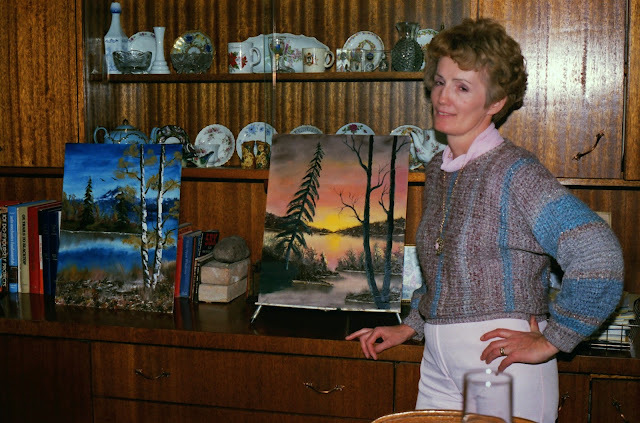 Here she's posing in front of a couple of her paintings - she took some art classes back in the 90s. I think her work turned out pretty well! Sadly, that particular talent didn't rub off on me, but I'm certainly grateful for everything she's taught me over the years. Happy Mother's Day, Mom!